This award, established in honor of the acknowledged "Father of American Conservation" - George Bird Grinnell - it is WMI's highest honor for individual contribution to conservation in North America. TTSS Congratulates Bob! Revered waterfowl biologist and consummate conservationist Robert "Bob" Blohm was honored with the Wildlife Management Institute's (WMI) 2012 George Bird Grinnell Memorial Award for Distinguished Service to Natural Resource Conservation. The award was conferred last month during the annual Conservation Administrators Luncheon at the 77th North American Wildlife and Natural Resources Conference in Atlanta, Georgia. The award, established in honor of the acknowledged "Father of American Conservation"- George Bird Grinnell - is WMIï¿½s highest honor for individual contribution to conservation in North America. 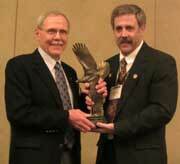 Presenting the award was WMI President, Steve Williams, who noted that Blohm's thirty-two year tenure with the U.S. Fish and Wildlife Service was characterized by "unassuming and selfless qualities of character and a dedication to the science and principles of wildlife management." During his career, Blohm served in a variety of leadership roles within the Service's Office of Migratory Bird Management. He started as staff biologist before moving on to Chief of the Section of Population, then Chief of the Branch of Operations (later renamed the Branch of Surveys and Assessment), followed by Deputy Division Chief, and, finally, as the Division Chief. 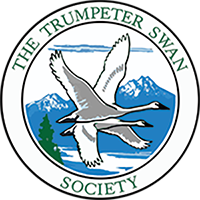 His extensive involvement in the administration and leadership of the Migratory Bird Management Office positioned him to play a crucial role in nearly every major North American waterfowl initiative or controversy since the 1980s. His contributions to the field of waterfowl management include the design of seminal waterfowl population studies, administration of duck banding programs for the "Stabilized Regulations" initiative, and the supervision of operations to integrate duck population dynamics into North American waterfowl hunting regulations for more than 20 years. Additionally, Blohm oversaw the completion of the waterfowl population trends report, harvest survey reports, the Waterfowl Status Report, Adaptive Harvest Management Report, and was instrumental to the framing of the North American Waterfowl Management Plan. "Those who have known and worked with Bob note that his leadership style, though quiet and understated, is founded upon a deep understanding of wildlife and an overriding confidence in the ability of well-informed people to manage their future," said Williams. "Bob's integrity, affability and calm demeanor have earned him a vast legion of friends within and outside the wildlife profession."